I've been following a Groundspeak thread on Colorado tracking errors for awhile now, but I was still surprised the other day on the trail when my Colorado 300 was tracking parallel to, but 400 feet away from my 60CSx. 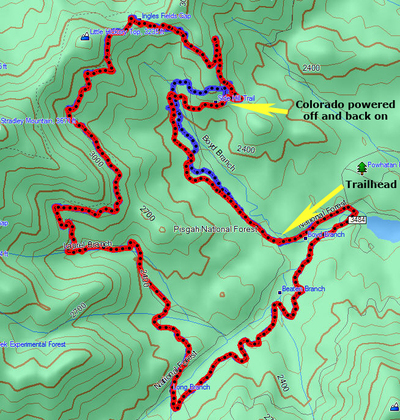 As soon as I noticed the error, I powered the Colorado off and back on, and it tracked true the rest of the ride. You can see above that the problem started soon after I left the trailhead (I was riding counter-clockwise). It's unknown what is causing this, but I'm betting it's the firmware for the chipset. For the record, I'm using chipset firmware version 2.6, along with Colorado beta firmware 2.51. To bring you up to speed on the Colorado, it's a very nice handheld, with a high resolution, albeit somewhat dim, display. If Garmin will fix the tracking error issue, and allow the display of multiple tracks, I should be able to recommend it as a GPS for hikers and perhaps bikers as well. World's largest GPS hoax A few days ago, stories started appearing online about an artist who drew a self-portrait with a GPS receiver carried around the globe by DHL. Trouble is, it was all a hoax. Wired does a pretty good job of debunking it, and now the artist has posted a disclaimer saying it was a "fictional work."